What is the function of the Internal Affairs Bureau? The Internal Affairs Bureau is responsible for receiving, processing, and supervising internal affairs investigations that involve allegations of criminal conduct and acts of misconduct made against members of our agency. 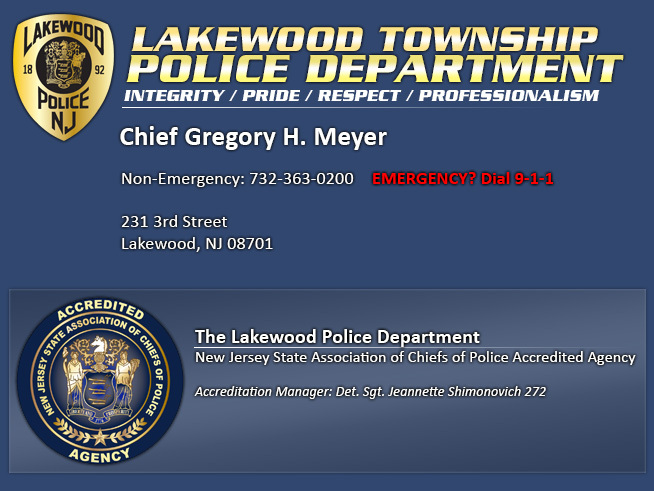 The Internal Affairs Bureau ensures that allegations made against members of the Lakewood Township Police Department are thoroughly and objectively investigated to their logical conclusion. The Internal Affairs Bureau maintains a comprehensive index of all complaints received which is submitted to the Ocean County Prosecutors Office on a regular and annual basis. What does the Internal Affairs Bureau do? The Internal Affairs Bureau has the responsibility to investigate all allegations of misconduct by members of the department, and to review and adjudicate all minor complaints which are handled by supervisors. In addition, the Internal Affairs Bureau will review all firearms discharges by Lakewood Township Police personnel that are not related to training, all use of force incidents, all vehicle pursuits undertaken by our personnel and all collisions involving police department owned vehicles. Complaints will be accepted in person, by telephone, by letter or email. It is preferred that the complaint be made in person by the individual who is directly involved in the allegation against the Lakewood Township Police Department employee, so we can ascertain as much information as possible to effectively investigate the complaint. During regular business hours an IAB Investigator will normally take the initial report, however in their absence any Police Officer can accept your complaint. They will forward it to the Internal Affairs Bureau for further investigation. Your Complaint will be sent to a specially trained IAB investigator who will conduct a thorough and objective investigation. If the complaint alleges minor violations of departmental policies or procedures or the complaint alleges acts of discourtesy, the complaint may be forwarded through the chain of command to the member’s immediate supervisor for resolution. • You might be asked to help in the investigation by giving a detailed statement about what happened or by providing other important information. • All complaints against law enforcement officers are thoroughly investigated. You will be advised in writing of the outcome. • If our investigation shows that a crime might have been committed, the county prosecutor will be notified. You might be asked to testify in court. • If our investigation results in an officer being charged with a violation of department rules or regulations, you might be asked to testify in a departmental hearing. • If our investigation shows that the complaint is unfounded or that the officer acted properly, the matter will be closed. • All disciplinary hearings shall be closed to the public unless the defendant officer requests an open hearing. Do any other agencies investigate complaints made against Lakewood Township Police Department members? Yes, The Ocean County Prosecutors Office conducts a review of any complaint that alleges a crime was committed. What rights do Police Officers have during an investigation? 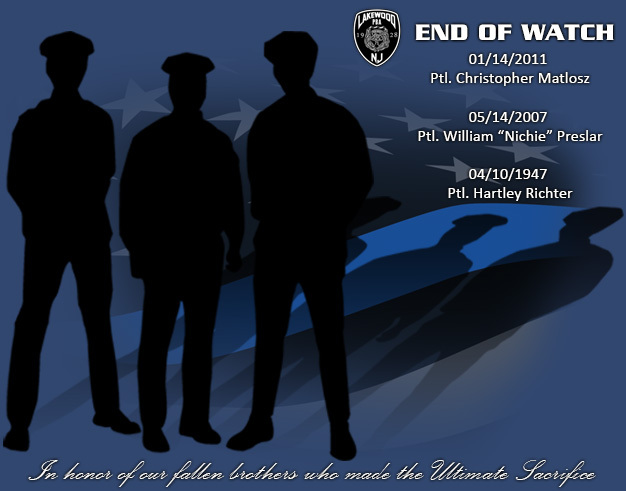 Police Officers are protected by the Law Enforcement Officer’s Bill of Rights and their labor contract. Internal investigations remain confidential until they are concluded. By law, no person involved in the investigation, including the complainant, witnesses, investigated members, or the investigators may disclose any information regarding the investigation until it is concluded. Is there any risk in making a complaint against a member? No. But if a person deliberately makes a false complaint and statement against a member, that person may be criminally prosecuted or held civilly liable. N.J.S. 2C:28-3 Unsworn Falsification to Authorities states, ” A person commits a crime of the fourth degree if he makes a written false statement which he does not believe to be true, on or pursuant to a form bearing notice, authorized by law, to the affect that false statements made therein are punishable.” Those who provide false information to members of the Internal Affairs Bureau will be prosecuted to the fullest extent of the law. What happens when the investigation is concluded? Once the investigation is concluded, you will be advised of the outcome in written form. Complaints from the public, whether substantiated or not, increase the awareness of the leadership of this agency to actual or potential problems, as well as the perceptions of the community. This feedback will ultimately assist in determining whether the mission statement and goals of this agency are being attained.